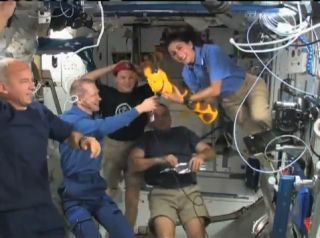 The International Space Station's Expedition 21 crew, and Harold the Giraffe (a toy held by astronaut Nicole Stott), speak with U2 singer Bono, his sons and bandmate The Edge during a cosmic call from Mission Control on Oct. 13, 2009. Thisstory was updated at 10:50 p.m. EST. A smallchunk of space trash made an uncomfortably close pass by theInternational Space Station late Friday, but not close enough to force theastronauts aboard to take shelter in their Russian lifeboats. NASA?sMission Control woke the six astronauts on the station from their sleep lateFriday as the spacedebris approached, but ultimately decided not to send the crew into theirSoyuz spacecraft to ride out the orbital trash?s near miss. The astronauts weretold they could go back to sleep. ?Sorry wehad to do it that way, and we had to wake you up in the middle of the night,?the station?s Russian Mission Control radioed the crew. The debris was expected tofly within 1,640 feet (500 meters) of the orbiting laboratory Friday night at10:48 p.m. EST (0348 Saturday GMT). Sending theastronauts into their Soyuz lifeboats would have been a precaution only.Earlier today, NASA officials said the space junk posed no threat to thestation or its crew, but news of its close approach came too late to steer themassive orbiting lab clear using its Russian thrusters. ?It?spretty unusual,? Kirk Shireman, NASA?s deputy station program manager, toldSPACE.com Friday. ?I wouldn?t be surprised if the need to do it for this[debris event] goes away.? That isexactly what happened. A closer analysis of the object by NASA Friday found itto be a small, 2-inch (5-cm) piece of space trash that would not hit the spacestation. "Goodnews," NASA?s Mission Control told the station crew. "The tracking datahas come through, and shown that the conjunction's no longer a threat to station.? The objectwas very small, making it difficult totrack initially, NASA spokesperson Rob Navias told SPACE.com. Stationastronauts thanked Mission Control for the news and were looking forward tograbbing more shut-eye. They went to sleep at about 4:30 p.m. EST (2130 GMT)and were due awaken to begin their Saturday in space in a few hours. "I'llget around to all my crewmembers here, and we can go back to sleep,? repliedstation commander Frank De Winne, a Belgian astronaut representing the EuropeanSpace Agency. ?Thanks a lot for working all this tonight, Houston." The spacestation is currently home to two Americans, two Russians, a Canadian and DeWinne, who commands the team?s Expedition 21 mission. This is notthe first time a piece of wayward space junk has come close for astronauts toconsider taking refuge in their Russian lifeboats. A close passby an old rocket engine remnant sent three station astronauts intotheir Soyuz spacecraft earlier this year in March. Since then, however, thespace station?s crew size has doubled to six astronauts, so two Soyuz vehiclesare currently docked to the station. NASA also delayedthe departure of a Japanese cargo ship from the space station last weekbecause of a space debris threat. There isalso a box-like buffer around the station that mission managers prefer to keepfree of any debris. That safety zone extends about 15 miles (25 km) around thespace station, as well as about a half-mile (0.75 km) above and below it. Thestation flies in an orbit about 220 miles (354 km) above Earth at a speed ofabout 17,500 mph (28,163 kph). But adebris avoidance maneuver ? as dodging space junk is known at NASA ? can takedays to plan. The space station?s Mission Control team did not have that timebecause of the short lead time, Navias said. Spacedebris has been a growing threat for manned spacecraft and other satellites inorbit today. Thecollision between twocommunications satellites earlier this year brought the issue to theforefront. It, as well as China?s intentional destruction of a satellite duringa 2007 anti-satellite test, have sparked a renewed push to better track, andpossibly reduce, the more than 20,000 pieces of space junk currently watched byvarious agencies.